Today’s Mennonites have their theological roots in the 16th-century Anabaptist movement, which was part of the broader Protestant Reformation. In 1525, fifteen adults living in Switzerland gathered to re-baptize one another, believing that baptism should be a conscious spiritual and communal decision, rather than a passive religious and political act experienced during infancy. This won them the nickname “Anabaptists,” meaning “re-baptizers.” These first Anabaptists also believed in the separation of church and state as well as rejection of participation in war. As the Anabaptist movement grew, its followers were intensely persecuted for these radical beliefs; they fled their Swiss and German origins for refuge in Holland, Russia, and the Americas, eventually settling across the United States and throughout the globe. Many faith traditions stemmed from the Anabaptist movement, including the Mennonites, the Church of the Brethren, and the Amish. Mennonites were named after Menno Simons, a 16th-century Dutch Anabaptist leader. Today Anabaptist Mennonites are an ethnically and racially diverse group. There are about 368,000 Mennonites in the U.S. and 1.6 million Anabaptists living in 82 countries worldwide. Some Old Order Mennonites and Amish still attempt to live “off the grid”, in plain clothes, without the benefit of electrical power and automobiles. But most Mennonites don’t live that way. We are pretty ordinary folks. You’ll find vibrant and growing Mennonite congregations everywhere, from small towns and cities to nearly every major urban center in North America. Christ is the center of our faith. Mennonites emphasize the life and teachings of Jesus as the lens through which we read Scripture and understand our place in the world. We believe that Jesus’ way is one of active peacemaking and resistance to injustice, and that our primary citizenship is in the Kingdom of God on earth here and now. We choose to follow Jesus’ way even when it requires opposition to government or subversion of social norms. Community is the center of our lives. Following Jesus’ way is made possible in a community of mutual accountability and support, a community that continually challenges its members to analyze and embody Christ’s life, death, and resurrection. We recognize the need for forgiveness from God, but also from each other as a means of developing such a community. In the end, though, we ask not what our church community can do for us, but instead what we as a community gathered by Christ can do for the common good. Reconciliation is the center of our work. Social action is essential to the gospel. As we seek rightness with God, we strive to live simply and care for creation. We work to make peace on levels personal and societal, using nonviolent means of conflict transformation and restorative justice. God’s Kingdom has no boundaries; in it, all belong. Our mission is to listen to the lowly, empower the marginalized, welcome the exiled, and dispel discrimination. 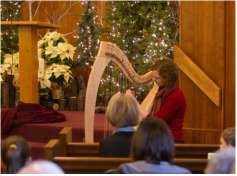 Music is an integral component of worship in most Mennonite churches. Rather than having a designated choir, the entire congregation serves as one body united in song by Christ and united in Christ by song. We use music to gather, praise, lament, plead, celebrate, narrate, and go forth from the service with new life. Music connects us with the rhythm and movement of the Holy Spirit. By joining in four-part harmony (a common practice in Mennonite congregations), we give voice to the complexity of life and embody the relational harmony that God envisioned for our world. 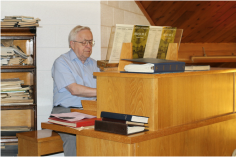 Most Mennonite congregations utilize many types of music: traditional hymns written in 1708 or 2008, contemporary praise music, gospel, folk, international and multilingual. 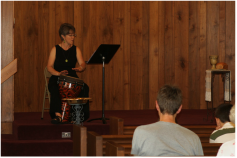 Here at First Mennonite of Iowa City our services are dominated by songs chosen from the Hymnal and Sing the Journey worship books, but supplemented by a diversity of other music. A visitor may experience an organ played during the “music for meditation” time, a Beatles song during the offertory, a djembe accompanying a Swahili hymn after the message, and boisterous piano playing sending us forth from the sanctuary.